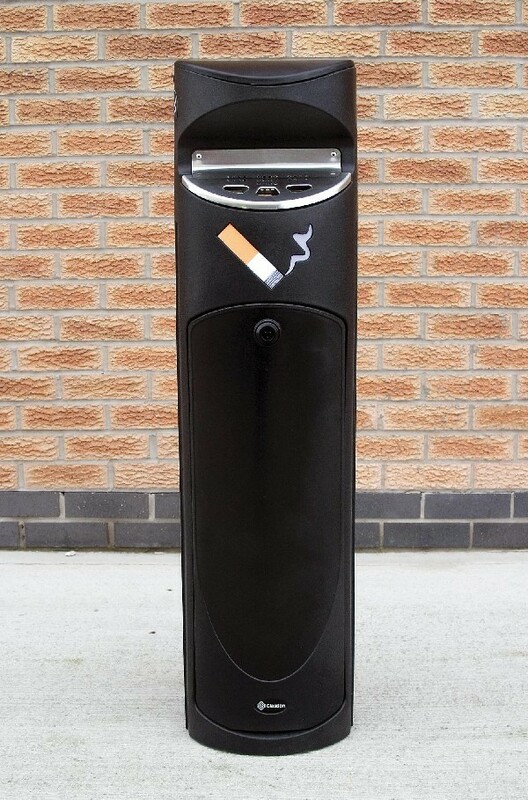 A purpose designed Cigarette Waste Receptacle. The ASHGUARD SG is durable and attractive. Manufactured in weather and vandal-resistant 100% recycleable (Black) Durapol ® polymer ensuring a long and maintenance free life. Cigarette graphics are positioned on the door, each side and on the back of the unit; allows to be reconised from any angle- 360 degree usage. Easily identifiable with 2 heat resistant stainless steel stubbing grilles and small aperatures for easy disposal of cigarette waste and small enough to prevent other forms of litter being deposited. Anodised aluminum domed top prevents litter being left on the top of the unit. Easily anchored to the ground (anchors included) or the free-standing option allows the unit to be removed and stored.